This anthology presents organ, harpsichord and piano concertos – the majority not hitherto published in modern editions – by Handel’s contemporaries and successors, including works by Felton, Cooke, William Hayes, Arne, Chilcot, Philip Hayes, Hook, Rush, Stanley, Charles Wesley, Crotch, Samuel Wesley and Russell, from among the 200 examples surviving from the period c.1740–c.1815. Among the most versatile genres of the time, it found popularity in pleasure garden, theatre, concert room and the home. 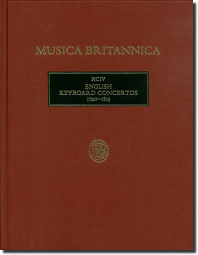 The contents of this volume show the form adapting well to the stylistic evolutions of the period from late Baroque via continental gallant styles to a mature Classical style, though retaining a strong native tradition linked with Handelian oratorio in the idiomatic distinction between virtuoso piano concerto and concertos for organ.